There are many unmarked graves in the Table Rock Cemetery. The location of some are known by burial records but there are many for whom there are no records, even though many of them reported by obituaries to be here. Note that the reference to burial records here is to an informal set of records held by the Historical Society. The Table Rock Cemetery Association has some additional records but they are fragile and difficult to review and we have refrained from imposing upon the Association except in cases of particular interest or important matters (such as locating the graves of veterans). This list (which continues to grow) is a small representation of the unmarked graves based on the best readily-available information. One article in the early 1900s referred to hundreds of unmarked graves, but there is no way of knowing the truth of the matter. 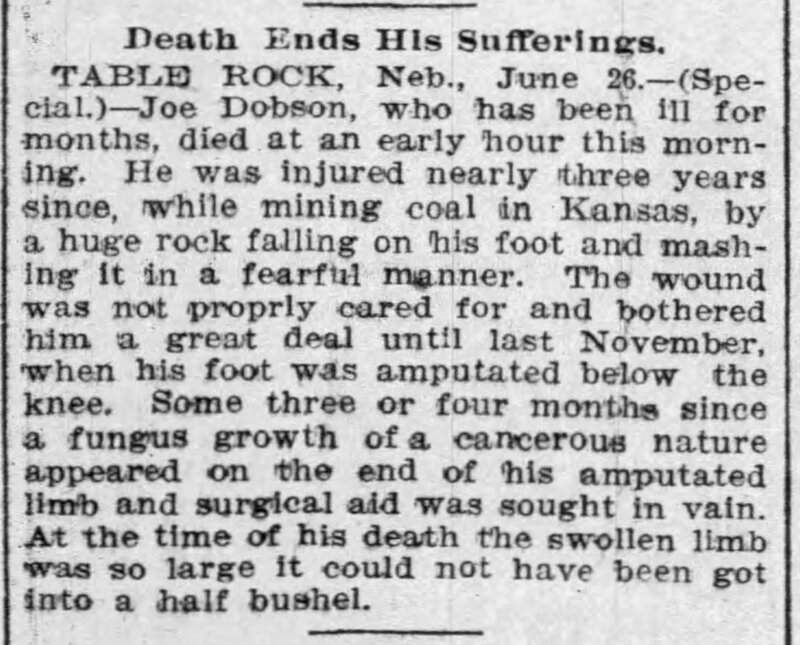 Table Rock Argus, May 1899. Jonathan Allison, one of the old setters of Pawnee county, died at his home in Sheridan precinct on Sunday morning, at the age of 86 years. He had been in failing health for some time, and those near him knew that death was hovering near, and that it would be but a short time until he claimed his victim. The funeral services were held at the home on Monday afternoon conducted by Rev. G. M. Gates, and the remains were buried in the Table Rock cemetery. He leaves a daughter who lives near DuBois, and two grandchildren, who made their home with him, to mourn his demise. Uncle Jonathan Allison, whose death is recorded else where lived in Pawnee county thirty-three years. He was for many years a republican and voted for John C. Fremont the first candidate of that party. He was also one of the very first men in Pawnee county to ally himself with the populist party. Her husband was killed in 1906; while attempting to repair a crushing machine, his shirt sleeve apparently got caught between large cogs and he was pulled into the them and instantly killed. Alzina was able to put up a substantial stone for him. However, by the time she died the resources of her two surviving children were apparently insufficient to do the same for her. The records do not appear to show where her grave is located. She was a sister of Julia Munsinger, whose grave is unmarked as well. Table Rock Argus, Mar. 19, 1942. MRS. ALZINA BAITEY DIES FRIDAY NIGHT...Was 83 Years Old. Mrs. Alzina Baitey, 84, passed away Friday evening after being ill for the past three weeks and in failing health for several months. She died here at the home of her daughter, Mrs. Arleata Hartmann, with whom she had made her home for the past fourteen years. Funeral services were held at the Kovanda Funeral Chapel Sunday afternoon. Rev. Cordts pastor of the Lutheran church at Falls City had charge of the services, assisted by Rev. W. H. Merrill of Table Rock. Interment was in the local cemetery. She leaves to mourn her passing her daughter, Mrs. Fred Hartmann of Table Rock; a son Alonzo of Falls City; six grandchildren, and seven great-grandchildren and other relatives and friends. Alzina Newton was born in Allen, Alleghany county, New York, on April 13, 1859. She was one of ten children. When she was two years old, her family moved to Illinois where they resided until 1876. They then moved to Independence, Iowa. Here she embraced the Presbyterian faith and remained a faithful Member until the dissolution of the church in that community. On October 5, 1880, she was united in marriage with Frank W Baitey at Independence. To this union one child was born in Independence, Alonzo, born on April 23, 1885. In 1893, the family moved to Table Rock, where two more children were born, Elnor Maud on June 29, 1893, and Arleata born June 8, 1895. Elnor Maud died while still an infant, after several months illness. On May 11, 1906, she was bereft of her husband, Frank, in a tragic accident at the Table Rock Brickyard. Mrs. Baitey was an honest, upright citizen and respected by all who knew her. After the death of her husband, she supported her family unaided. In 1932 her sister, Julia Munsinger, died and in 1935 another sister, Elizabeth Thomson of Minneapolis, preceded her in death. Out of town relatives and friends attending the funeral of Mrs. Baitey were: Mr. and Mrs. Lester Jones, Mr. and Mrs. A. H. Baitey and son Marvin, Mr. R. O. Thompson, all of Falls City; Mrs. Alberta Baitey Jones, Wayside, Kansas, Mr. and Mrs. L. D. Munsinger and daughter of Omaha, Mr. and Mrs. Frank Hartmann, Brownston, Indiana, Mr. DeRoy Baitey, Lincoln, Nebr., and Mr. and Mrs. Elmer Hartmann of Omaha. Nothing is known of her other than that she was the daughter of Byron and Mary Jane Dow Kent, was born in Indiana in 1868, had a younger brother George Kent, her mother died in 1886 )although her father lived into the 1930s), she married Garret Alonzo Barnett Oct 25, 1889 in Pawnee County, had a son Byron in 1890 who lived to be 80 years old, and she died in 1892. Perhaps she died in childbirth, as was often the case. It is unknown. Elizabeth J. Bently, widow of Oliver G. Bently was born February 14, 1838 in Pennsyvania. She died at Warm Springs, Montana, March 15, 1920. The remains were brought to Table Rock for burial by her son. (line skipped?) Price Hobbs, of Gordon, Nebr. on Monday March 29th, accompanied by her daughter and the latter's husband Mr. and Mrs. William Cooper, of Wymore. Mrs. Bently lived in Table Rock for many years, where her children grew to manhood and womanhood. W. W. Blodgett, a Civil War veteran, is shown by Cemetery Board records to be at rest in the northeast quarter, at "1-50-8" but there is no headstone at that location. Dates of birth and death are unknown, and research for getting a military tombstone has been difficult. Sophina was the wife of James Carlock, who for a time was the postmaster at Table Rock. It appears that Sophinah died, then her baby followed shortly after. Baby Elizabeth was the last of possibly 9 children. Everett, whose grave is marked, died young also, at the age of 5. Little Everett and Elizabeth had been forgotten by his family by the time his father died in 1924. His father's obituary lists six surviving children but does not mention those who went before. In a February 24. 1893 edition of the Argus, the last of a series of articles about the hangings and events leading up to them says that the three were buried together in a grave on the west side of the cemetery near the Barnard family lots. In 1893, the sexton was confident he knew where it was but had not “tested his knowledge.” Unfortunately, no description was given as to where the sexton was confident they were. The Barnard family lots are in the northwest corner of the southwest quarter. 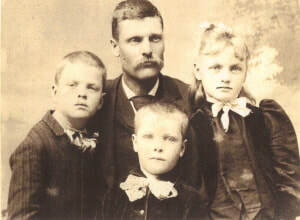 Luther married Hanna in 1854, and they had ten children, four girls and six boys. Luther died at some time between 1880 and 1900 because they were listed in the 1880 census as together and in the 1900 census Hanna was listed as a widow. 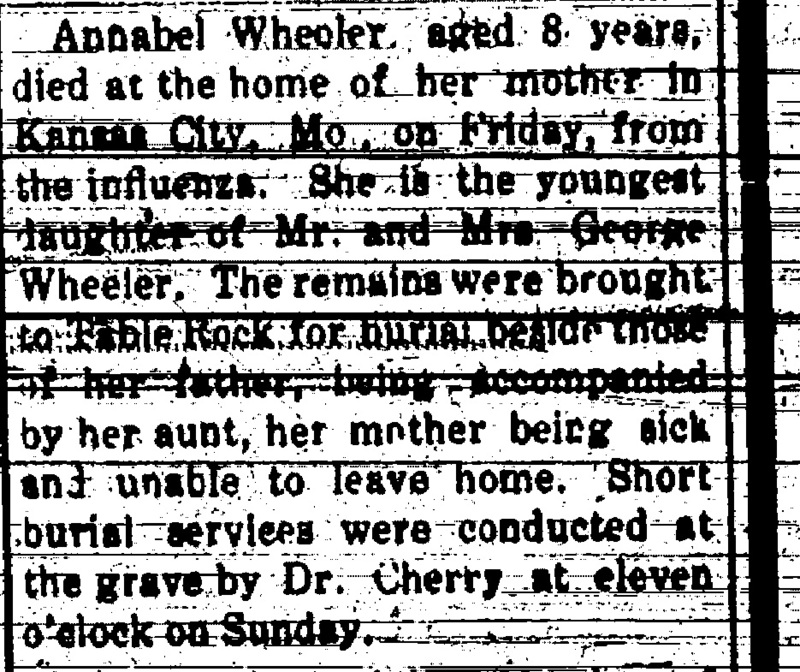 Hannah's obituary in 1912 says her body was taken to Table Rock. Presumably she is in the Table Rock Cemetery, where some of her children are also buried. Reportedly, an announcement of her death says that she was to be buried by her husband's side. However, the unofficial cemetery records that the Historical Society has does not list either Luther C. or Hannah and we have not found a marked grave, especially not near their children. Their son Luther N. and his wife Viola have a tombstone (4-D-2 & 3) and there are many open spaces around them where unmarked graves may lie. Their granddaughter Elizabeth Bowen is buried at 4-D-5 and there is a stone. Their son Rufus is buried at 4-D-7 and there is not a tombstone. There are many spaces to either side where unmarked graves may lie. Perhaps these three family members are there. 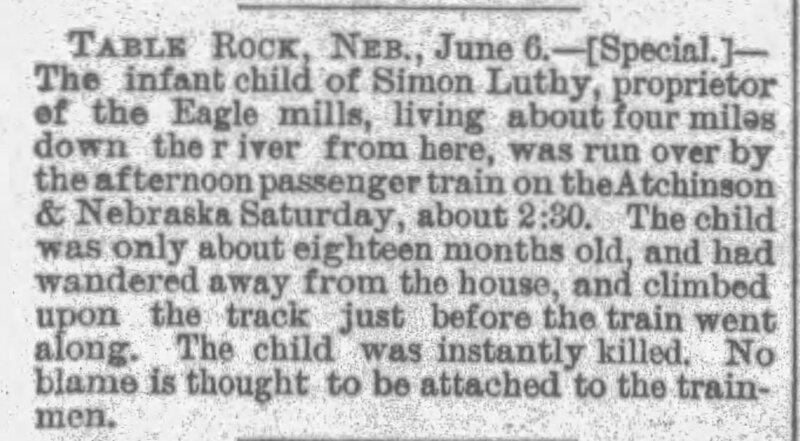 An infant buried under sad circumstances as reported in the Nebraska State Journal of September 27, 1897. (There are no surviving editions of the Argus.) 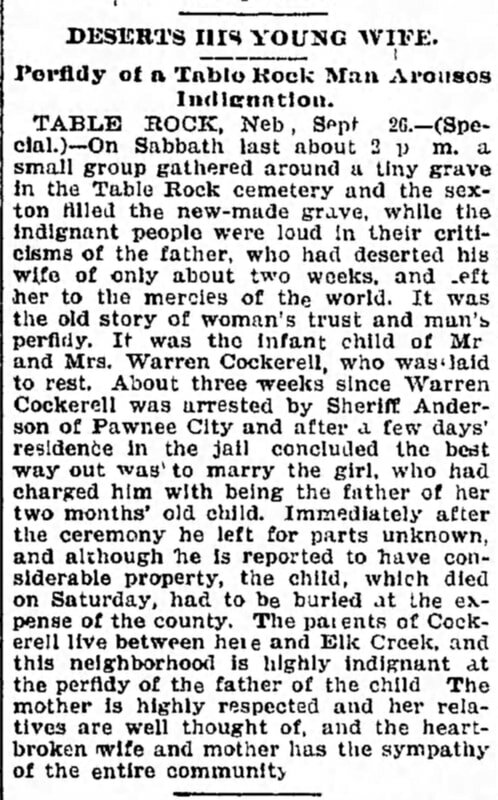 According to the article, Warren Cockerell of Table Rock was jailed after a young single lady of a respectable family named him as the father of her newborn child. He was thrown in jail until he married her. Once he had married her, he took off. Whether the baby's death had anything to do with the abandonment is not stated. The article, so quick with words like perfidy, indignation, heart-broken, and sympathy does not mention the baby's name nor even its gender. His parents graves are marked. Vernon was a son of Henry & Phebe Cooper, contemporaries of Elias & Catherine Wood Cooper. These two Cooper families may not be related. Her husband Thomas died in 1932. At Sarah's funeral in 1967 were "Mrs. Letha Cooper and grandson Jimmie Cooper." Was Letha Cooper a daughter and Jimmie her own grandson? Or was Jimmie Cooper Sarah's grandson? the obituary is vague. Between Sarah and James Cooper, Sr., is Claud Cooper, son of Thomas, who died 1955 at the age of 51; his obituary says simply that he was survived by his wife; Sarah must have been a setpmother. One would think that the Coopers in plots 1 - 6 are all related, presumably with Elias & Catherine Wood Cooper as the common element, but it has not yet been sorted out. Here is a summary of the examination of this part of the cemetery. Lot 6 James Cooper Sr.
An attached photograph shows Section 43 looking from north to south, with the stone of Elias and Catherine closest to the camera. Careful examination shows that there are only four tombstones. Beginning with the stone to the north side of the section and continuing south, there is a tombstone for Elias and Catherine, then one for Sarah's husbamdThomas. Then there is a very large stone with the family name that is in the middle of the section, which would seem to be where Sarah would be buried, with the next tombstone being Claude’s and the last lot being grass covered and with no stone, which is where James Sr.., is buried. The next tombstone belongs to the next section and is difficult to read but one can make out that it is the stone of a child who lived from 1891-1893 In sum, there are no tombstones for either Sarah or James Sr.., in this section where, according to the burial records, they are at rest. Dr. Carl Clifton Covert and his wife Laura are buried next to her parents, along the east-wide central road in the northwest quarter of the cemetery. Her father's grave is now marked with a military tombstone, dedicated in 2016 by the Sons of Union Veterans of the Civil War. However, the graves of Dr. Covert & Laura are unmarked, as is the grave of her mother. 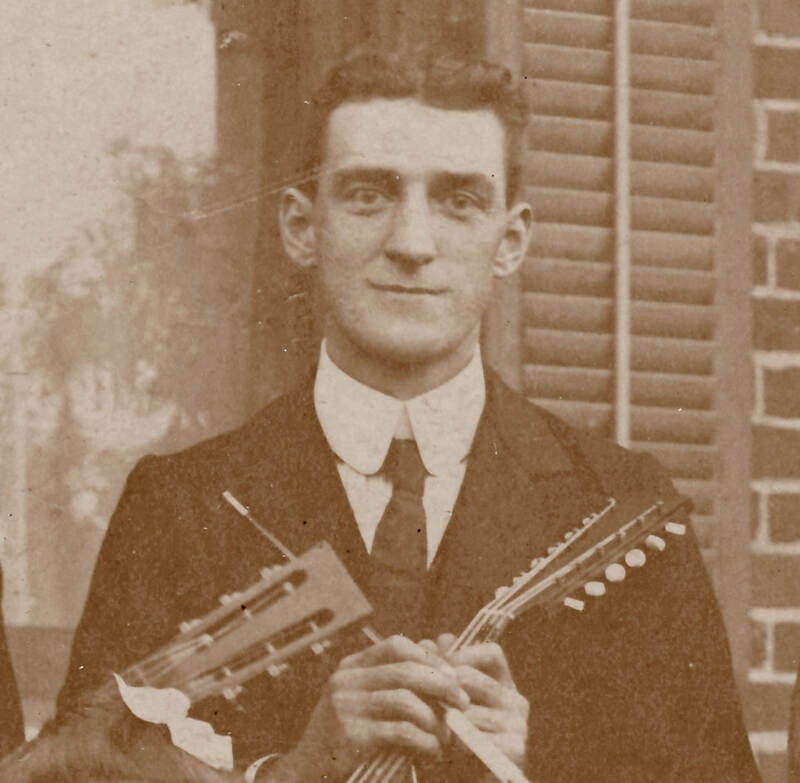 Dr. Covert in the detail of a 1910 photo of the Table Rock Mandolin Band. ​He died in Albany, Missouri, and she died in New Jersey. Both were brought home to Table Rock and are buried in Graves 2-53-1 & 2. Laura Mumford as a young woman, Photo 2008. He was 39 when he a tramp he was attempting to arrest at the depot pulled a gun and shot him. The murderer was never found. An extended story about the crime is posted on the FindaGrave memorial. "Marshal Craig was buried in the Table Rock Cemetery. 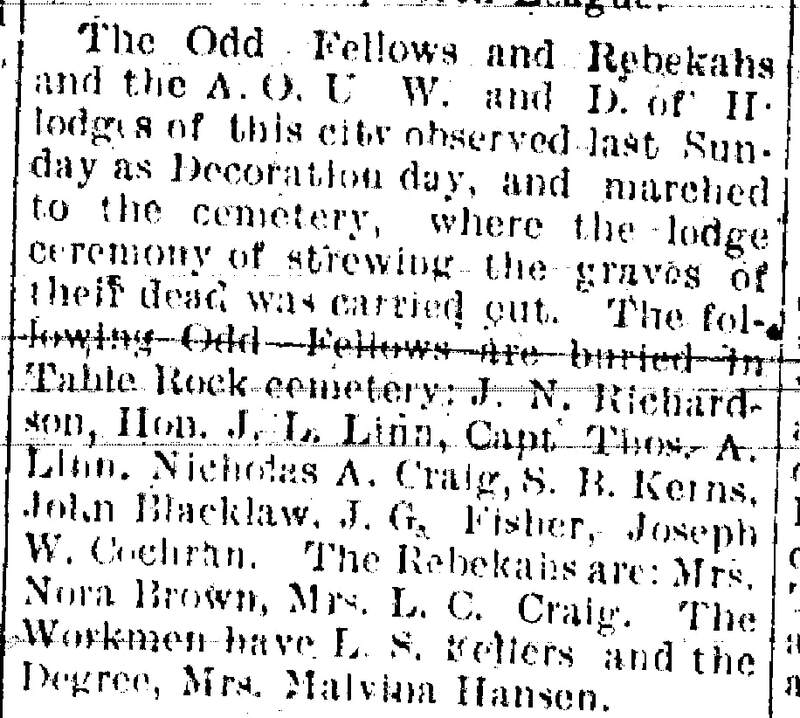 The International Order of Odd Fellows, which lodge he belonged to, conducted a “largely-attended” funeral." In the circa 1890 photograph at right, the bottom is annotated, "When clay was first taken from the Norris pasture, N. A. Craig, Boss." There are only two men who are not obviously laborers, the man on the left and the man standing above him. One is probably a company official, the other probably the "boss" of the workers. Which one is Craig? He would have been in his early 30s at the time. As the man in charge on the ground, he probably would not have worn a pocket watch, which would put the man on the ground as him. On the other hand, the man on the ground may be a little older, and looks like one of the Civil War veterans in a photograph of he old soldiers taken only a few years before. Which is Craig? We don't know. And it is the only photograph citing his name. 1903 -- The whereabouts of his grave was apparently known then. He owned four plots in the northeast quarter but there are not records of burials there. He may be there, though. We don't know when he was born or died but we know he is buried close to the middle of the northeast quarter, as Katy Kreifel, keeper of the Cemetery Association records, found an old record annotated with the burial location. His burial in the cemetery is confirmed by lists of the graves of old soldiers of the Civil War whose graves were paid tribute each year on Decoration Day, such as the list at right from the May 31, 1900 edition of the Argus. ​There is no marker. Research to get the necessary information for a military stone has been difficult. Christian Dennis died at 87 and his obituary his short. The obituary says specifically that he was buried in the Table Rock Cemetery but there is no listing for him in the unofficial records held by the Historical Society. His grave is unknown and unmarked. His wife Susanna, who died before he came to Table Rock, is buried in Illinois. There are four Dennis graves in the cemetery, all in one group at 4-76-1 to 4, for John, Iva, and Sarah Dennis and Sarah's husband John Cox. Christian died in 1913 and Iva and Sarah followed shortly thereafter, in 1914 and 1916. Where is Christian? Not here. In 4-76-1 is the unmarked grave of John Dennis, no dates of birth of death are listed in the burial records. He was probably the first to die, but we don't know where he fit into the family. Christian did have a son named John Clinton Dennis, born in 1859, and that John reportedly lived to adulthood and is buried elsewhere. Of course, it was not unknown for a parent to re-use the name of a child who had died very young but John Clinton Dennis, born in 1859, was alive and well when the family came to Table Rock. In 4-76-2 is Iva Dennis (1885-1914), who died at the age of 28, unmarried. Her grave, like John Dennis's, is unmarked. Her obituary says that she was orphaned as a child; her aunt Sarah Dennis Cox raised her. Who were John and Iva? Because Iva's last name was Dennis, one might suppose that her father was one of Sarah's brothers; however, Christian's obituary names his children, including a daughter who predeceased him and the others were alive. Was the John Dennis who is buried here the father of Iva, perhaps an uncle or a cousin to Christian? Without an obituary it is almost impossible to know, and without a date of death it is almost impossible to get an obituary. In 4-76-3 is Christian's daughter Sarah Dennis Cox (1855-1916), and next to her is her husband John Cox, in 4-76-4. Those graves are marked, making it easy to determine where those of John and Iva are. Interestingly, just a ways south of Sarah & John Cox's marked graves (not adjacent to them) are two concrete foundations which presumably once supported tombstones. Who lies in THOSE now unmarked graves? Well, that's another story. Born January 6, 1826, in Middletown, Pennsylvania, where he lived till the age of 24, he united with the Presbyterian church in Mount Carroll, Ill., at the age of 24. His wife died in the year 1881 and ten years later he moved to Nebraska. He leaves to deeply regreat his departure, four children: George of Auburn, Neb. ; John of Washington; Edward of Idaho; Sarah Cox of Pawnee City. Laura died at the age of 17, in Mt. Carroll, Ill. He was a faithful attendant at church as long as he was able to hear and a consistent Christian throughout his life and expressed a willingness to answer the call at anytime. The funeral services were held at the Presbyterian church. Rev. C.P.W. Wimberly preached the sermon. The burial took place in the Table Rock cemetery. Miss Iva May Dennis was born at Mr. Carrol, Illinois, December 11th, 1885 and died in Omaha, Nebraska, March 12th, 1914. Miss Dennis lost her parents when a small child and was raised by Mr. and Mrs. Cox, who live about four miles west of Table Rock. For the past eight years she made her home in Omaha. The funeral service was held in the Presbyterian church last Monday at 12:30 o'clock. That death loves a shining mark has received a new verification in the death of this beautiful young lady. By hard work she built up a good business, with dear friends who appreciated and loved her, with a pure beautiful life she had much to live for. From a human standpoint she died too young- for how bright the light that is quenched- how potent the ministry of such a beautiful young life- how gracious the influence the friends and loved ones will miss- how deep the sorrow they shall feel so keenly and so long! Did we say she died too young? She died early but she lived long enough to develop a character of exquisite symmetry and beauty- long enough to impress her influence upon a rapidly widening circle of friends. Her eternal summer shall not fade. She lived long enough to make a record that will give help and inspiration to others lives. Now she is called up to a higher and simpler life in the world of redeemed spirits. The tender sympathies of many friends go out to the bereaved and to all that inner circle smitten with this great sorrow. CARD OF THANKS- We wish to thank our friends and neighbors in Omaha and Table Rock especially Chester Fisher and wife for kindness shown us in our sorrow. Her parents were James & Serena Dobson; when Nellie died, her mother was 51 and her father had died three years before at the age of 81. Her name was Nancy Ellen but she went by Nellie. Nellie was born in 1870, a late life baby who followed four other children born between 1857 and 1862. She had two brothers, William and John, but they died at ages 3 and 5 before Nellie was born. She had a sister named Aretha who would die ten years after Nellie, at age 40. And she had a sister named Ann who who would live to be 101. Nellie was 20 when she died and was married to William Finn, who would go on to live a long life. She had a son named Leslie Dobson Finn but we don't know what happened to him. What happened to her? We don't know. Where is she buried? That is one thing we know: Sect. 3-Lot 28-Space 2. 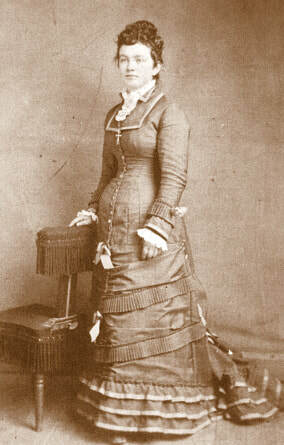 Serena Earley was born in 1839, married James Dobson, and arrived in Table Rock in 1855, well before the wave of the settlers of the Nebraska Settlement Company, who came in 1857. In the 1880 census, Serena was listed as being paralyzed. Her husband James Dobson died in 1887, almost 30 years before her. She married Jacob Penrod the next year. He was then a widower of 70; he died in 1895 and is buried in the Cincinnati Cemetery near Dubois where his first wife lay. Serena and James Dobson husband had five children, and they died at the ages of 3, 5, 20, 40, and 101. Only the long-lived one survived to bury Serena. The stone of James Dobson is badly damaged and Serena's, if ever there was one, cannot be found. Luella Hinrichsen says that there is a large fieldstone near James Dobson's grave but no record of where she was buried; it is not known whether that has always been there or was used as a tombstone. Her obituary says she was buried in the Table Rock Cemetery. He died in Table Rock, other Dobsons are buried in the Table Rock Cemeter, and at least two other Dobsons with unmarked graves. There are three Dobsons are on the unofficial burial records held by the Historical Society (James, John B., and William J., died 1860, 1867, and 1887 respectively), as well as Nellie and Serena, a mother and daughter with married names. For these reasons, we think it likely that Joe Dobson is one of the many graves in the cemetery that are unmarked. 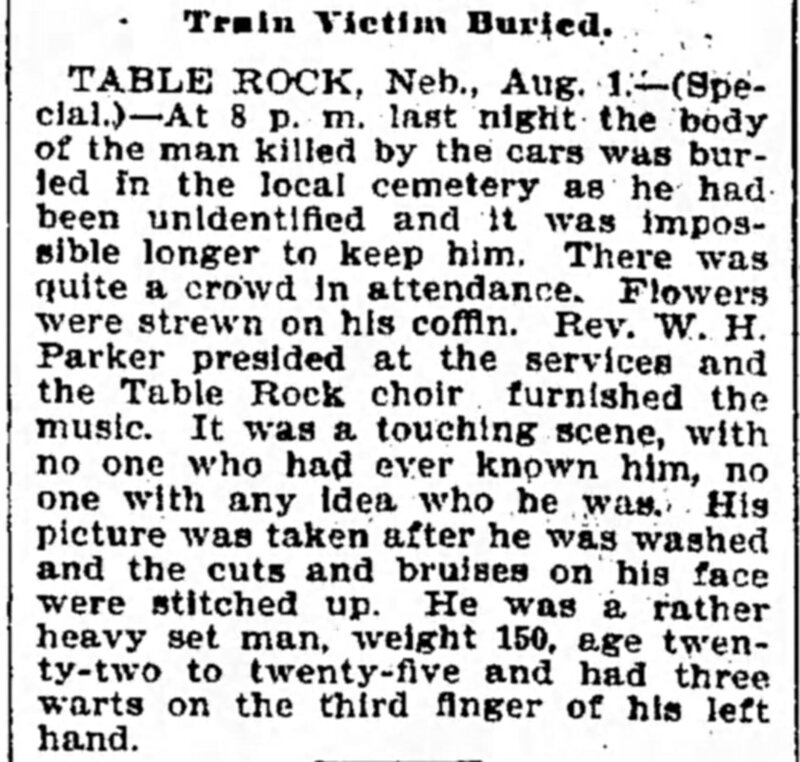 From the August 2, 1899 edition of the Nebraska State Journal comes a story about a man killed in a train accident whose identity was apparently never learned. They cleaned up his body and took his picture in hopes that it might lead to identification; who knows where the picture went to. The funeral service of Mrs. Harry Edmondson took place from the M. E. Church on Tuesday afternoon. The deceased had moved from Table Rock to Kansas only a few weeks ago and was taken seriously ill and taken to a hospital in Kansas City, where she was subjected to an operation under which she died. The body was brought to Table Rock for burial beside the grave of her son. Rev. A. L. Ogden preached a sermon on the shortness of life. Her husband, two sons, two daughters and her aged father were among those who came with the body. a more extended history of her life will be given next week. Capitola, who went by "Tola" was born in 1873; she married Harry Wilson in 1893. She was 49 years old whens he died in Kansas City. As was an oft-repeated custom, her body was brought "home," to Table Rock for burial. She was the daughter of Jeremiah and Nancy Moore Wilson; her father lived a long life but her mother had died 40 years before at the age of 38. The article cites four children, two sons and two daughters, but it was three sons and two daughters when counting the son who had gone before: Leoneo, Clement, Henry, May, and Rosa. Henry had died in 1916 at the age of 16. One of the saddest accidents in the history of Table Rock occurred about 5 o'clock on Sunday afternoon and resulted in the death of Henry Paul Edmondson, a young man sixteen years of age. In company with Frank Mort, a boy about the same age, he had gone out squirrel hunting, and in coming home on the Griffing land east of the brick yard, the two boys got to scuffling, and in the scuffle the Mort boy's gun was accidentally discharged, the load taking effect in the Edmundson boy's left knee, producing an awful wound, the load lodging in the calf of the leg. The cries for help of young Mort brought Lawrence Griffing and others to the scene, and he was carried to Mr. Griffing's home. Young Mort hurried for a doctor and Doctors Harmon and McCrea were soon at the wounded boy's side. Efforts were made to stop the flow of blood and the lad was carried to the Jennings corner and from there taken in an auto to Dr. McCrea's office, where the wound was dressed and the injured boy was taken to his home about 9 o'clock. But the shock and loss of blood was too great for the system to stand and the life of the young man ebbed out about 1 o'clock. There is no blame attached to the Mort boy, as the scuffle was all in boyish play, and the gun was accidentally discharged. Henry Paul son of Harry and Capitola Edmondson, was born October 1, 1900 at Corydon, Iowa. Two and one-half years ago the family moved to Nebraska and have made their home at Table Rock since last July. On the 29th of October he was accidentally shot and died the following morning at the age of 16 years, 29 days. He leaves a father and mother; two brothers, L. W. , of Paola, Kansas, and C. M. of Centerville, Iowa and two sisters,May and Rosa, of Table Rock, besides more distant relatives, and friends to mourn their loss. The funeral services were conducted by the Rev. S. E. Taft at the home on Wednesday at 2 p.m. Interment in the Table Rock cemetery. In the bereavement which came to them in so awful a manner, the parents and other relatives have the deepest sympathy of the community. A young Lawrence Griffing from an undated band photo. Excerpt from Photo 163. The whereabouts of his grave in the Table Rock Cemetery likewise is unknown. Dr. McCrea, who tried to save his life, in 1941. Ada died during the influenza pandemic. Her family lived in Omaha but their roots were in Table Rock. An October 25, 1918 notice in the Argus says that the body "will be shipped to Table Rock for burial." Young Dorris died during the influenza pandemic. Services were held at the Presbyterian Church, offering an inference that he is buried in the Table Rock Cemetery. Findagrave.com does not reflect resting place elsewhere in Pawnee County, at least as of November 2016. She is buried at Grave 2-12-5 with many others of the Freeman family, but there is no stone. 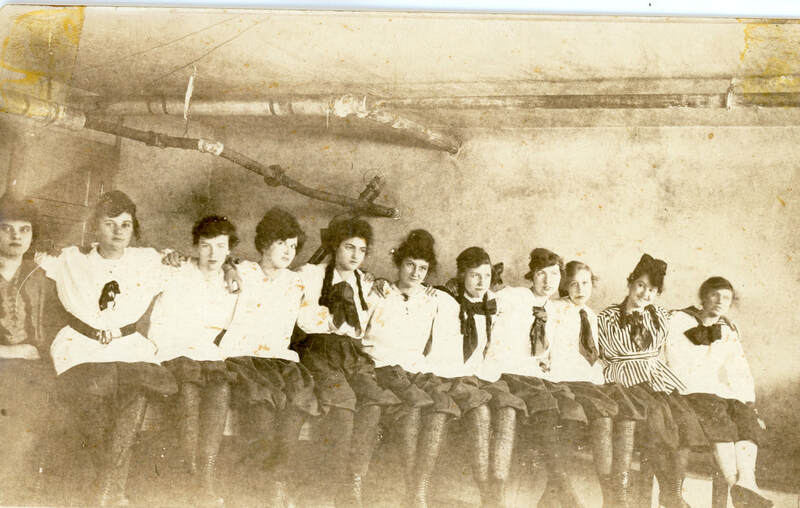 Peggy is fourth from the left in this 1916 picture that appears to be of a high school sports team, probably girls baketball. Photo 6357.
an old soldier of the civil war buried next to his beloved wife; a neighbor at birth, her obituary said they had been "rocked in the same cradle"
Al Fulton died at the Old Soldiers Home in Leavenworth in 1912, at age 63, and was buried next to his wife, who had predeceased him. They are along the central north-south road in the northwest quarter of the cemetery. You can read their lovely story in the link below. "A voice I loved is stilled." Hanna Jane died first, in 1857 age 1, and was the 3rd person to buried in the Table Rock Cemetery. (Who was first is unknown.) Julia died in 1859 at age 18, H.N. died in 1860 at the age of 60, and Juliana, who after she was widowed married Tom McClure, another first-wave pioneer, died in 1875 at the age of 67. There is much to be said of this early pioneer family, and this entry may later be amended. Their son John N. Gere, killed by Indians in 1870, is buried on the west side of the northwest quarter. There are many open spaces to either side of his grave, and one wonders whether his grave was placed to be among the father and sisters who had died before. However, the location is unknown. No newspaper accounts exist to confirm they are there, but they came to Table Rock in 1856, were active in the community, never lived anywhere else, and died in Table Rock. Funeral services for George S. Griffing were held at the Kovanda Funeral Chapel Friday afternoon at 1:30 conducted by Rev. E. V. Price. Interment was in Table Rock cemetery. George S. Griffing was born September 5, 1860 in a log cabin one half mile south of the village of Table Rock. Died at Lincoln, February 7th, 1939 aged 78 years, 5 months and 2 days. He was married to Eva Samson, March 4th, 1881. To this union three children were born, John Griffing now living in Lincoln, Della May of Long Beach, California, and Mildred Reisen of Lincoln, Nebraska. Mrs. Griffing passed away about ten years ago. Mr. Griffing is one of the family of eleven children. Only one of whom, O. W. Griffing is now living. United with Table Rock Methodist Church June 5th, 1898. In his passing another Pioneer of Table Rock is gone. His daughter, Mildred was the only out of town relative who was able to attend the service. George Griffing is at the far right in this circa 1921 photo taken at a billiard parlor now occupied by Harry Griebling photography (next to the Argus museum). With him are Argus 194p, zoom in on the four men, who are Lewis Day, John Cockrill, and Alva Aylor, Sr.
Eva's mother Emeiline -- did Eva look like her? (We have no pictures.) Photo 3035. Eva died in 1928 at the age of 64. Eva's grave seems to be unmarked, but she is in the northeast quarter: 1-1-8., very near her parents, early pioneers Russell & Emeline Samson. Perhaps her husband, who died after her, is nearby. Eva was a year old when her father sat with the last of the three horse thieves to be hung while Rev. Giddings was making the speech of his life trying to stop the lynching. Eva Sampson was born just northeast of Table Rock in Nemaha county, December 15th, 1862, and passed from this life in Lincoln, Nebraska November 8th, 1928. At the time of her death she was 66 years, 10 months and 23 days of age. For the last ten years of her life her health has been very poor, necessitating her being in Lincoln a great part of the time. She was married to G. S. Griffing March 2nd, 1881. To this union three children were born, two daughters and one son. Mrs. Mildred Reisen of Grand Island, Nebraska and one son who lives in Falls City, both being present at the funeral services, and one daughter who is living in California at the present time, and was unable to attend the services. Mrs. Griffing is survived also by her husband whose home is in Table Rock, two brothers who live in Arizona and five sisters, four of whom make their home in California, and the other sister, Mrs. Herbert Harrison, who was present, and whose home is in Ravenna, Nebr. Mrs. Griffing joined the Methodist Episcopal church of Table Rock, June 5th, 1898, a little more than thirty years ago. Funeral services were held at the Methodist church in Table Rock, November 12th at 2:30 p.m., conducted by J. Arthur Miller, pastor of the church. Burial was made in the Table Rock cemetery. The location of their graves is known: 4-51-1 & 2, which is in the southeast quarter, a little east of due center of that quarter. A. D. likely was one of the original Table Rock Hortons. He and his wife lived in "Dakota" and had five children. 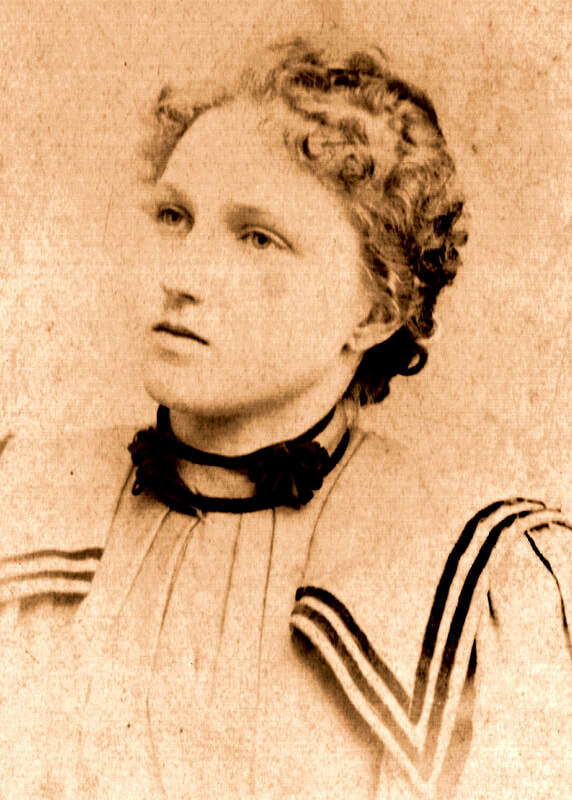 They "returned" to Table Rock in 1895 and she died shortly thereafter at about age 26. Perhaps she was ill and her husband came back to be amongst friends and relatives. In any event, A. D. was working at the brickyard when he died at age 50. His obituary consists primarily of a detailed account of the circumstances of his death by apparent heart attack. Abraham married a second time; that wife, Alice Palmer, survived him and herself remarried. Table Rock Argus, Apr. 19, 1906. HORTON, A. D., a well-known citizen of Table Rock, died very suddenly on Tuesday evening from neuralgia of the heart. He had worked at the brickyard all day apparently in his usual health, but at 6 o'clock when he started for home he complained of not feeling well and rode up town with Art Barrett, leaving the wagon at the Tibbet's corner and walking through the park toward his home; when he reached a point opposite Norris' store he saw Dr. McCrea on the street and called on him that he wanted to see him at his office; the doctor told him all right, to come across and wait a minute and he would go with him, so he came and sat down on the sidewalk in front of the Norris store, when the pains came on him again; the doctor gave him something for relief, and sent for a team and when it arrived Mr. Horton got up and walked to the wagon and the doctor accompanied him home, where he soon seemingly got better and the doctor left for his home. Shortly after the doctor left, he was again attacked with acute pain and in a few moments he became rigid, his eyes set, and Mrs. Horton sent for help and the doctor, but he was undoubtedly dead before the arrival of either. The deceased was 50 years, two months and 3 days old, had lived here when a boy and then left a number of years lived in Dakota, but came back here with his family about eleven years ago, shortly after coming back his wife died, leaving a family of five children, the youngest being about two years old. Mr. Horton was a member of the A.O.U.W. [Ancient Order of United Workmen, a fraternal organization of railroad men], and carried $2000 insurance in the order, the policy being made to the children of the first marriage, never having been changed since his second marriage. The funeral services were held this afternoon at the M. E. Church, conducted by Rev. J. T. Roberts, under the auspices of the Workman Lodge. Mr. Horton was a quiet, industrious man, a kind husband and father and had many friends among the people of the community. Margaret and David Jones came to Table Rock from Carmarthenshire, Wales via Pennsylvania, Wisconsin, and Iowa. They came by wagon to Tble Rock, lived a few months there, then settled on a homestead southwest of Table Rock/northeast of Pawnee City, in 1860. Their daughter Margaret Jones Coard's obituary in 1918 said that "the old farm, undivided, [was] still held by the children." At least six children lived to adulthood, Margaret (1844-1918), Henry (1845-1902), Emma Jones Harrison (1860-1936), John S. Jones, Albert T. Jones, and Jacob H. Jones. Three others identified in the 1860 and 1870 censuses were Elinor (born about 1851), Mary (born about 1857), and Simon (born about 1859). Margaret Jones' obituary lists five as surviving (as of 1910) -- Margaret, Emma, John, Albert and Jacob. Her son Henry had preceded her. He had married Ellen Sedoris and they "lived to raise families. Two children were buried in the Table Rock cemetery in the sixties. Henry Jones enlisted in the war after coming here, and was outlived by his mother eight years, although he died thirty-seven years after the close of the war." And thus we know of two little children -- of Henry & Ellen Jones -- who lay somewhere in the Table Rock Cemetery. Their grandchildren and many relatives are near, but their father, Henry, is in Pawnee City, with wife Adelia A. Reynolds Jones (definitely not named Ellen, so perhaps a second wife). Henry's daughter Myrtle, born in 1872, and son Claud, born in 1880, both whom lived to adulthood, are also in Pawnee City. Wesley died during the influenza pandemic. Services were held at the Presbyterian Church, offering an inference that he is buried in the Table Rock Cemetery. Findagrave.com does not reflect resting place elsewhere in Pawnee County, at least as of November 2016. Charles and Maye Belle Stanek Luthy (died 1986 and 1989 respectively) are the only Luthy family members buried in Pawnee County, at least that could be found on Findagrave.com as of November 2018; they are buried in the Pawnee City Cemetery. 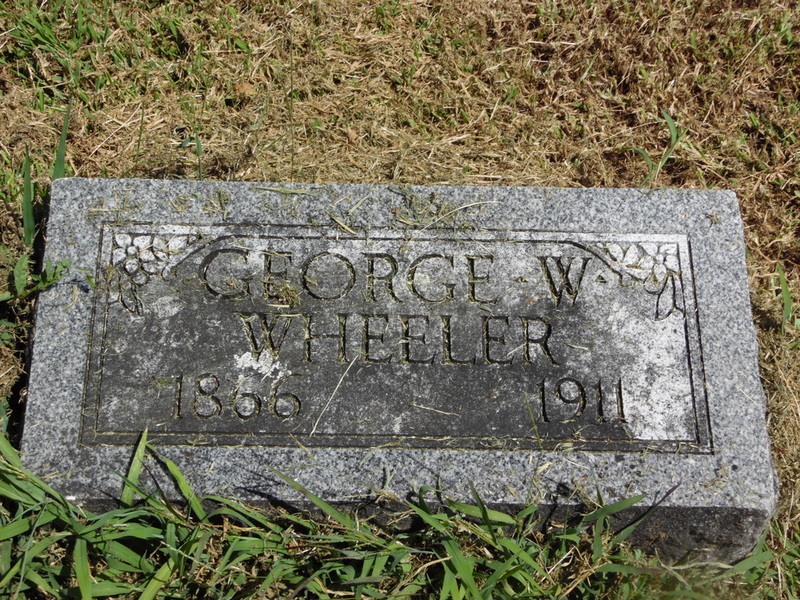 Findagrave lists 12 Luthy family members buried in Richardson County, buried 1911 to 2004, but not this baby. The Historical Society does not have access to burial records for cemeteries other than those in and near the town. Perhaps the baby is buried in Richardson County but the grave is not yet listed on the website. The Luthys pretty originally lived on the Pawnee County side of the Pawnee-Richardson County line, so the baby could be buried in either county. For now we will call it an unmarked grave. Mike McCort's grave is one that is only unmarked, but unknown. He is in the Table Rock Cemetery. We know that because Luella Hinrichsen, poring over old editions of the Argus, found his obituary. It is especially poignant. Mike McCourt, whom nearly every man, woman and child in this vicinity knew at least by sight, is dead and buried. ​For twenty five years or more he has lived here. He was a bachelor and lived alone in a little house on a thirty-acre tract of ground northeast of the city, which he has owned and occupied for several years. Mike was eccentric in the extreme, his brain mechanism not always working harmoniously, but he was never known to injure anyone. One of his vagaries was a belief that his enemies had set the spirits on him and that these demons haunted his house to do him injury. On Friday, Mike was found outside his house "in a helpless condition." He was cared for and his condition improved but then he fell and hit his head, an attributed attributed to a "paralytic stroke" and shortly thereafter. Mike's burial leaves question never to be answered about his relationship to the Catholic Church. He was said to have money, but he kept his financial affairs to himself. He was said to have made a will giving his property to the Catholic Church. However, the obituary reported that burial in the Catholic Cemetery (St. John's, northeast of town) had been REFUSED. There were no funeral services; no priest at the grave; but amid a silence, broken only by the falling of the clay upon the coffin, the body was laid in its tomb. Perhaps in its utter silence the burial was more impressive than had there been elaborate ceremonies, but it is unusual. Their graves are unmarked but we know where they are. Squire Mumford (so-called because he was a Justice of the Peace for many years), is in Grave 1-32-2, Mrs. Mumford is at 1-32-3, and their daughter Ruby is at 1-32-6. There are no records showing who, if anyone, is in 1-32-4 & 5. He was born in 1808 but we don't know when he died; it was probably prior to about 1898, as the Argus editions prior to that date are scarce. Maria lived a long life (1801-1885) as did their daughter Ruby (1836-1905). The only obituary found has been that of Ruby. ​The August 18, 1905 Argus reported, "Ruby Mumford died at the home of A. E. Heywood on Thursday night of last week. She was 71 years of age and had been an invalid nearly all of her years of life, and the latter years was entirely helpless. She came to Table Rock with her parents in 1857, and has been a continued resident of this city ever since. The funeral services were held at the home at 4 o'clock on Friday afternoon, conducted by Rev. W. A. Taylor, and the remains were laid to final rest in Table Rock cemetery." Burial records show that Melissa Huntley Mumford Richbardson is by the side of her first husband, Henry Mumford. Her and Henry's daughter, Laura, is next to them as well as Laura's husband, Dr. C. C. Covert. The only marked graves of the Henry Mumford family are of Henry and little Alice, daughter of Henry and Melissa. Their obituaries both establish that they are buried here. TABLE ROCK ARGUS, Apr. 8,1932. George B. Munsinger was born in Ohio May 16, 1861, and died at Omaha April 1, 1932, at the age of 70 years, 9 months and 15 days. On April 16, 1885, he was united in marriage to Julia Newton at Independence, Iowa. In 1891 they came to Table Rock where they made their home until the recent death of Mrs. Munsinger. To this union six children were born: Don, Elinor, Ray and Roy having preceded their parents in death, Leslie at Omaha and Meres at Table Rock. Those who mourn his departure are his two sons, two brothers, Will at Scottsbluff and Rollo at Albion, and three sisters, Mrs. James Wallick, Mrs. Mattie Foreman and Anna, all of Albion. Mr. Munsinger was taken to the hospital at Omaha for treatment but grew worse and died Friday morning at about 11 o'clock. The body was brought to Table Rock for burial beside the remains of his wife who preceded him in death only a few weeks ago. Funeral services were held in the Methodist church at 2 o'clock Monday by Rev. Ted Shephard, pastor of the Presbyterian church of Humboldt, assisted by Rev. W. E. Caldwell, pastor of the Methodist congregation. Mr. Munsinger had been a resident of Table Rock for about forty years, has always been a hard worker and devoted to his family. The surviving children and other relatives have the sympathy of the community in their bereavement. Mrs. Julia Munsinger, wife of George Munsinger, passed the sorrows of earth to the eternal world at 2:15 Sunday morning. For some years past she has been in poor health, growing more and more feeble in the passing days. She suffered from cancer of the stomach, for some time could eat nothing, her life being sustained by milk, and even this could not take during the last few days. She leaves her husband, two children, three grandchildren, two sisters, a number of nephews and nieces, and other relatives. Their oldest son Leslie, who lives in Omaha, could not get here in time to see his mother before she passed away. Her sister, Mrs. Thomson, could not get here because of the condition of her health. The funeral services were held in the Methodist church Tuesday afternoon by Rev. Theodore A. Shepard, pastor of the Presbyterian church of Humboldt, assisted by Rev. W. E. Caldwell and interment was in the Table Rock cemetery. Mrs. Munsinger had been a resident here since 1891. Julia Newton Munsinger was born April 23, 1862, at Nora, Illinois, and died at Table Rock January 24, 1932, at the age of 69 years, 9 months and 1 day. She moved with her parents to Independence, Iowa where she was married to George Munsinger April 16, 1885. They stayed in Independence, Iowa till 1891 when they came to Table Rock where they have since resided. Shortly after their arrival in this city, Mrs. Munsinger joined the Presbyterian church and remained a member of that church until its resent closing. To this union six children were born: Ellsor, Don, Ray, Roy preceded their mother to the Great Beyond. Leslie at Omaha and Meres at Table Rock remain to mourn their mothers passing. The others who remain are her faithful Husband, George, three grandchildren and Julia, who has lived with her grandmother since a baby. She leaves two sister, Mrs. M. B. Thomson, of St Louis Park, Minn. and Mrs. Alzina Baitey of Table Rock. Funeral services were conducted from the home and from the Methodist church. Alice was thrice married. In 1893, at age 20, she married Albert Harmon and they had two children; we don't know what became of him. In 1903, she married Abraham D. Horton and they had two children. Abe died of an apparent heart attack at age 50. His grave is unmarked. He was buried by the side of his first wife, who had died 8 years before Alice married him. Alice again married in 1911, at age 38, marrying John Smith; they apparently had no children; he was 16 years older than her. John was a widower; his first wife, Nancy McCurry, had died in 1907. Alice lived to the age of 60. She died in 1934. Her third husband, John, the only husband to survive her, died in 1937 at the age of 80. Alice's second husband, Abe, is in an unmarked grave and so is Alice, who lies on the other side of John's stone from his first wife, Nancy. Alice Palmer was born in Iowa on April 1, 1873. When she was a child the family came in a covered wagon and settled on a farm in Clear Creek in this county. At fifteen she confessed her faith in the Lord Jesus Christ and became identified with the Baptist church. 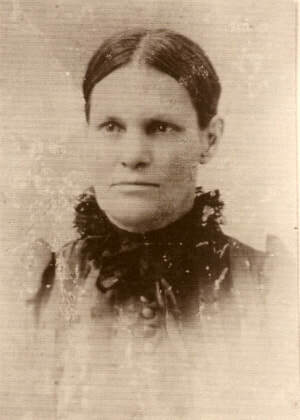 She grew to womanhood in this community and January 26, 1893, she was united in marriage to Albert Harmon at Tecumseh. To this union two children were born, Boyd of Oakland, Calif. and Ralph of Tuscon, Ariz. September 6, 1903, she married A. D. Horton and to this marriage were born two children, Mrs. Ruth Spradley of Tecumseh and Cecil David Horton of Table Rock. On November 4, 1911, she was united in marriage to John Smith at Pawnee City and they made their home in Table Rock. Mrs. Smith has been in poor health for several years but became confined to bed about a week ago. She departed this life at home August 14, 1934, aged 61 years, 4 months and 13 days. Besides her immediate family she is mourned by a brother and many other relatives. She was a good wife and mother, a considerate neighbor and friend. 18-year-old Mary Rubis died during the influenza pandemic. Her fiance's parents took his body back to his hometown. Mary's father came to Table Rock and decided to bury her here. No burial record nor stone has been found as of yet. She was the daughter of first-wave pioneers Russel & Emeline Samson and sister-in-law to Eva Samson Griffing (whose grave is unmarked as well). As a young mother, she went to the dentist and her husband later that day received a telegram that she was dead. 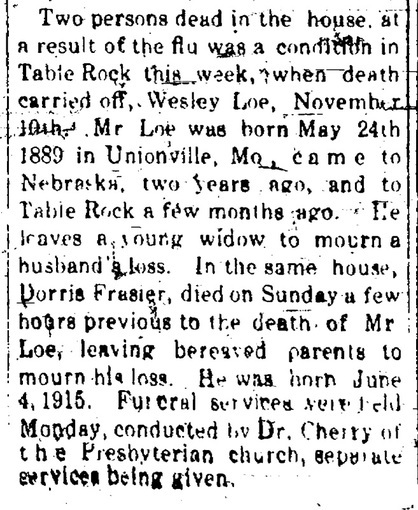 They lived in Kansas, but he bought his wife's body to be buried in Table Rock, where as a young woman she had taught country school. He is buried in plot 1-1-6, next to his parents Jasper & Ella Skillet, who outlived him by many years. Jasper died in 1948, Ella (also Mary Ellen) in 1960. Ralph Jasper Skillett was born near Table Rock on January 8, 1900, and passed away on Wednesday morning, February 5, 1919. His death was caused by contracting the influenza which developed into pneumonia. 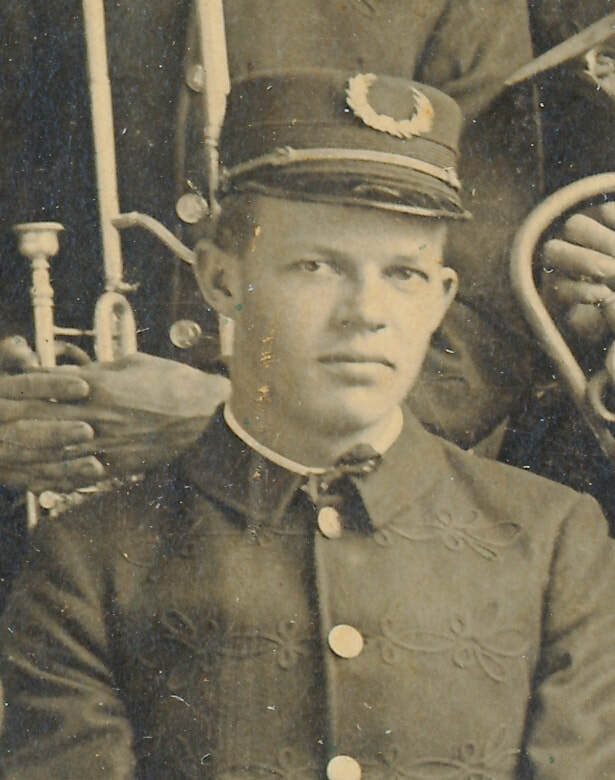 In 1916 this young man graduated from Elk Creek high school and about a year ago moved to Baileyville, Kansas, where he made his home until the time of his death. He leaves to mourn his demise his parents, Mr. and Mrs. Jasper Skillett of Baileyville, Kansas, two brothers, Elmer Skillett of Table Rock, Bert Skillett of Baileyville, Kansas, and three sisters, Carrie Morton, Table Rock, Mrs. Goldie Roberts, Elk Creek and Mrs. Elsie Wopata, Table Rock. Funeral services were held at the Table Rock cemetery on Friday afternoon, Feb. 7th, at 3:30, conducted by Rev. Dunning. The sympathy of the entire community is extended to the bereaved parents and relatives of the deceased in their sorrow.-Table Rock Argus. She died of the flu in the 1918 wave of the epidemic. Her obituary says she is buried at her father's side, but there is no stone there.